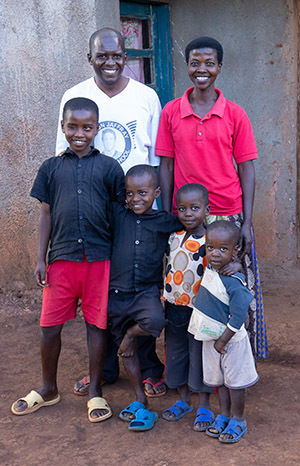 Obed is a typical rural farmer in a dry region of Rwanda. Over the last two years, his life has been completely transformed by the training that he and his wife have received from an ADRA project. Here is his story, in his own words. “Before we joined..our knowledge was very basic. We are subsistence farmers, living right on our farm. Our plot is small and the crops that we were growing were not enough to feed our family through the year. We did not know anything about growing vegetables or even that vegetables were important for growing children. We knew nothing about nutrition or balanced diets. If you would have seen the backyard to our house back then, you would have seen just a field of weeds and bush. Now, as you can see, it is full of vegetables! 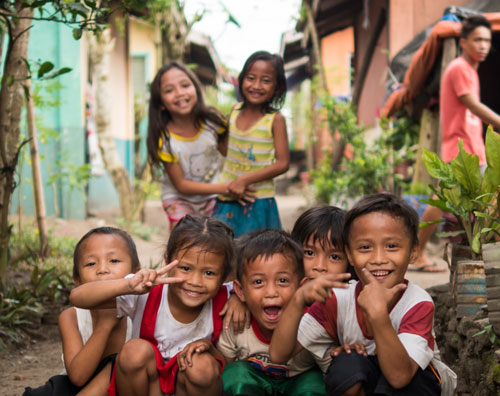 We first heard about the project when the village leadership called for all parents with children under five to come together for a meeting. It was here that we were told that a project was coming that would give parents training on how to keep your children healthy. That sounded very interesting to us and so we joined up. We have learned a lot about how to use the land that we have, using a variety of organic and permaculture methods. The way we used to cultivate our land was not very productive. Now we are growing a lot more food on the same land. We are now growing a rich variety of foods that are providing nutritious meals for our family as well as extra income. We have even planted a number of fruit trees! Before the ADRA project, we used to grow primarily beans, potatoes and bananas on our farm, and that was it! We just had no idea of what was possible. Now, every meal we are enjoying a variety of vegetables and greens. We try and have a serving of fruit every day. By the grace of God, our children are now growing healthy and strong. Some of the vegetables are completely new to our area. For example, take the soybeans. There were a few immigrants in our province that were growing soybeans so we used to call them an “immigrant crop”. We had no idea of the nutritional value. Now we are growing soybeans in among our maize. We mix the two together to make a very nutritious porridge for the children and adults as well. Beets were another new crop. All we knew was that beets were a food for sick people, that it helped build up people’s blood. ADRA gave us some seeds and said, ‘Just give them a try!’ We started growing them and we discovered just how wonderful fresh, organic beets can taste. The children just love them! At first, we were just eating the root part, but we soon found that the green tops were also very delicious. I shared this discovery with the members of my groups and they said, ‘OK, we will give it a try’. The next time that we got together, they all had the same testimony as me. Beet greens are great! Beet greens have become totally adopted and used throughout our village. We don’t use any chemical fertilizers in our garden whatsoever. We only use natural fertilizers made by composting, using manure. The soils throughout this region have been overused and we have had to use a lot of natural fertilizers to build up the soil and make our vegetable grow as well as they are. This part of Rwanda is known as the driest region in the whole country. In most other parts of Rwanda, people are able to grow their crops all year long with three good harvests. Here we have traditionally been able to only grow one crop a year here as the rain only comes for about three months of the year. However, using the different permaculture techniques that we have learned, I have been able to grow vegetables here by our home all year long. We have had beets all year. 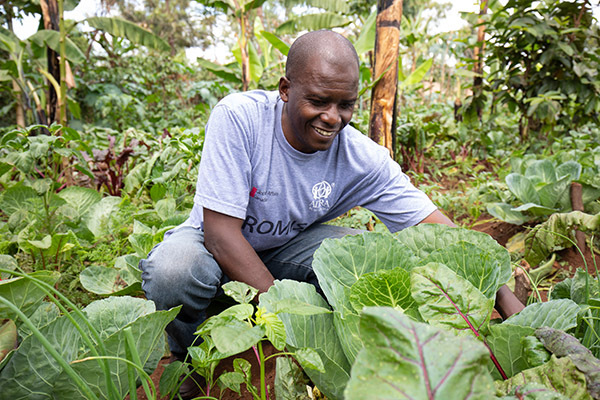 Obed works out in his back yard that has become a lush garden full of nutritious vegetables for his family. As a PROMISE group leader, Obed uses his kitchen garden as a demonstration garden for others in his village. He has become an enthusiastic promoter for organic gardening and has had many converts! 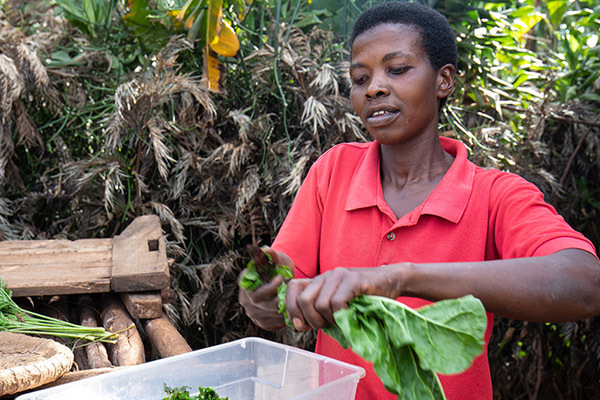 Obed’s wife prepares some fresh picked greens to add to the evening meal. 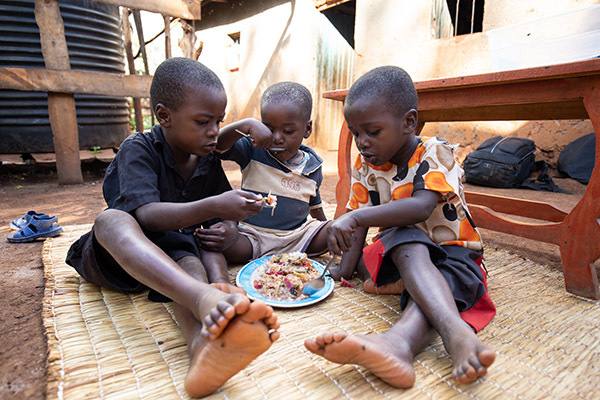 Obed’s children share a meal that is full of a good variety of organic vegetables and greens that have just been picked from the family kitchen garden.